Music has its share of “unsung” heroes, although occasionally they achieve recognition in unexpected ways and at unexpected times. Born in 1909, Solomon Linda grew up in Zulu country in South Africa. He never learned to read or write, but he was much admired as a singer. 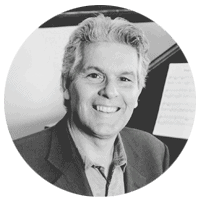 He moved to Johannesburg in his 20s and formed an a cappella band he called the Evening Birds, who built a popular following with their distinctive style. Inspired by traditional call-and-response chants, they built four-part harmonies with Linda’s improvised vocals soaring over the top. In 1939 Linda worked as a cleaner at the Gallo Record Company. One night after his shift he was permitted to use the studio to record a song he called “Mbube”, meaning Lion in Zulu. It became a big hit and made Linda a star among black audiences. Unfortunately, as Gallo had purchased the recording from Linda (for a reported ten shillings), Linda never earned anything from the sales. It was musicologist Alan Lomax (another unsung hero we’ve mentioned in a Story of a Song) who started the song on its worldwide journey. In his role as folk music director for Decca Records, he was sent the song and showed it to folk innovator Pete Seeger. He adapted the song for his band The Weavers, keeping the chanted chorus and a version of Linda’s improvised melody. He named his version “Wimoweh”, a misheard version of the original chorus “Uyimbube” (“you are a lion”). It reached the top ten on the Billboard charts in 1952. “Wimoweh” saw many cover versions through the 1950’s, but the next development edged the song further away from the original. In 1961, after the successful doo-wop group The Tokens used the song to audition for RCA Records, some producers from the label were impressed enough to try to develop a pop version. Along with a full band, they employed a soprano for extra vocals, but the real master stroke was to adapt an especially inspired segment of Linda’s original improvisation into a melody with the now-famous lines “In the jungle, the mighty jungle, the lion sleeps tonight”. Although The Tokens were initially unconvinced by this arrangement of a song they loved, they were persuaded to let it out as a B side. It seems, though, that the record-buying public saw something more in the song. 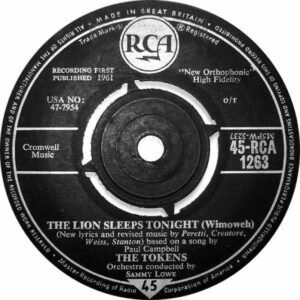 The famous version of “The Lion Sleeps Tonight” by The Tokens, with no mention of Solomon Linda. The now-named “The Lion Sleeps Tonight” reached number one at the end of 1961 and inspired a seemingly endless string of covers. The trouble was that as the song evolved, no provision was made for recognising Linda’s original work. 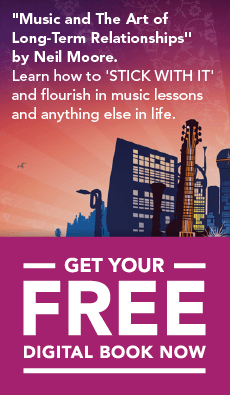 It seems in the complicated process of licensing and publishing, either Linda’s ownership of the composition was ignored, or nobody quite followed the legal trail back to the original composer. As Seeger has put it: “The big mistake I made was not making sure my publisher signed a regular songwriters’ contract with Linda. He sent Linda some money & copyrighted The Weavers’ arrangement & sent The Weavers some money.” When Seeger realised the error, he arranged a donation of $1000 and his share of ongoing royalties to Linda, but it seemed even this never found its way back. The next twist was in 1994 when the song was featured in the movie The Lion King. The thread was picked up in a Rolling Stone article by journalist Rian Malan, in which he estimated the royalties from the film alone at $15 million. The story was adapted into a documentary, A Lion’s Trail. The surrounding publicity prompted a lawsuit against Abilene Music, who had licensed the song to Disney. In 2006, 44 years after years after Linda had died in poverty, he was acknowledged as the composer of the original song and his estate was awarded the rights to past and future royalties. In the meantime, in the townships of Soweto and elsewhere, The Evening Birds’ sound was developed over the decades into a sophisticated style, sometimes referred to as Mbube, reintroduced to the west by groups such as Ladysmith Black Mambazo and the Soweto Gospel Choir. The simple four-chord progression (I, IV, I, V) originally heard in Linda’s scratchy recording has formed the basis for countless songs, and has reverberated throughout western popular music. It wouldn’t be outrageous to claim that the now-ubiquitious four-chord circle song (comprising four chords evenly spaced and repeated through the song) grew from this tune. With so many renditions of this song, we’ve put together a playlist of some that added their own flavour. Take a listen and let us know which one is your favourite. I remember listening to this with my dad throughout the years. The first time was when I was 3 years old in 1969. I’m so glad to have found the background to this beautiful song.